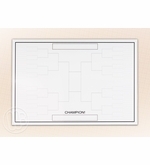 Dry erase sport magnets from OptiMA Inc. A large dry erase print of your favorite sports field laminated onto a large roll up magnetic sheet. 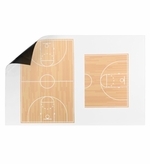 Large magnetic dry erase prints for coaches and teams to use in the locker room that will stick to any magnetic marker board or any smooth steel surface. 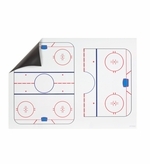 Each, 30" x 42", super strong magnetic sheet shows an image of the full sized court, field or rink and then a blow up section of the goal area. The colorful image is then covered with our very own exclusive clear dry erase writing surface to protect it for years of trouble free use. You won't find a nicer and cleaner erasing dry erase writing surface. When you're done in the locker room, roll the magnet back up, print facing out and store it in the corrugated shipping tube that it comes in. Everyone is made in the U.S.A. and comes with a black dry erase marker and Opti-Wipe™ dry erase wiping cloth. 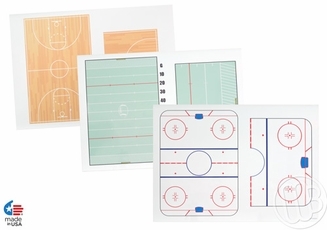 Custom prints and other sport fields are always available. Heavy Duty 2x3 Magnet lets you track as many as 64 teams in the next big tournament.